The Chrysler Portal has no B pillar, with two mostly glass sliding doors that meet in the center. LAS VEGAS -- Fiat Chrysler Automobiles is trying to court millennials with a futuristic vision of a minivan. 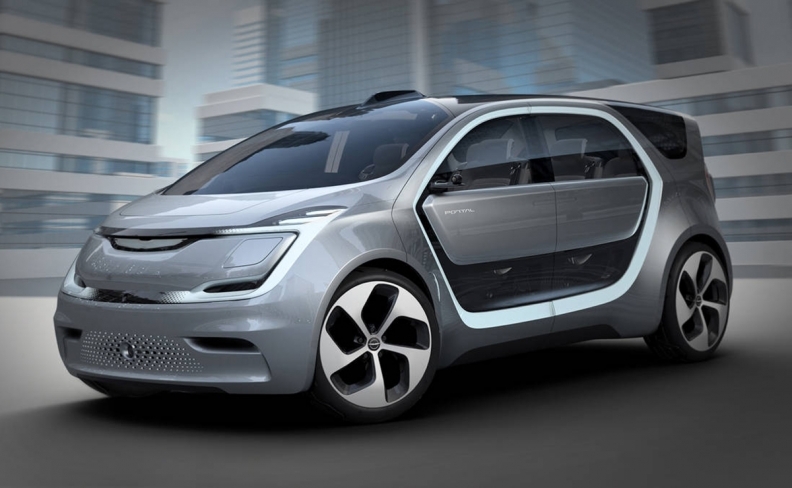 The automaker on Tuesday unveiled its electric minivan concept, the Chrysler Portal, at CES, the industry trade show formerly known as the Consumer Electronic Show. The Chrysler Portal, if built, would be entirely battery-powered with a 250-mile (400 km) range per charge, have autonomous capabilities and enough screens to keep every passenger entertained. “We wanted to design a vehicle discerning millennials would recognize as a true object of desire,” said Ashley Edgar, one of the concept’s engineers. Millennials are defined as Americans between the ages of 20 and 36 in 2017, according to Pew Research. The group became the largest U.S. living generation in 2016, with a population of 75.4 million, according to Pew. FCA’s concept holds six seats that can be easily removed or added as young families grow and driver interests change. Instead of a steering wheel, there is a device similar to the control wheels used in airplanes. The device would retract into the dashboard when the car is in autonomous mode, which is intended to be used for highway driving. The Chrysler Portal has no B pillar, with two mostly glass sliding doors that meet in the center. The roof is also largely glass, supported by carbon fiber beams. The minivan would also be compatible with mobile devices, with charging docks and “plug and play” capabilities for mobile recording devices like a GoPro. The automaker did not say if the Portal will ever be built, but it partnered with Panasonic, Adient and Magneti Marelli on the concept. The FCA’s concept comes just a few weeks after the introduction of 100 self-driving Chrysler Pacificas, which were produced in partnership with Waymo, formerly known as Google’s autonomous vehicle project.